Risk premia strategies allow the actual diversification of investors’ sources of returns at a portfolio level and enable portfolio managers to target absolute returns across various factors and asset classes. The ever-growing understanding of their attractiveness is making investors shift their portfolios towards these solutions, although they are still effectively inaccessible to many of them. 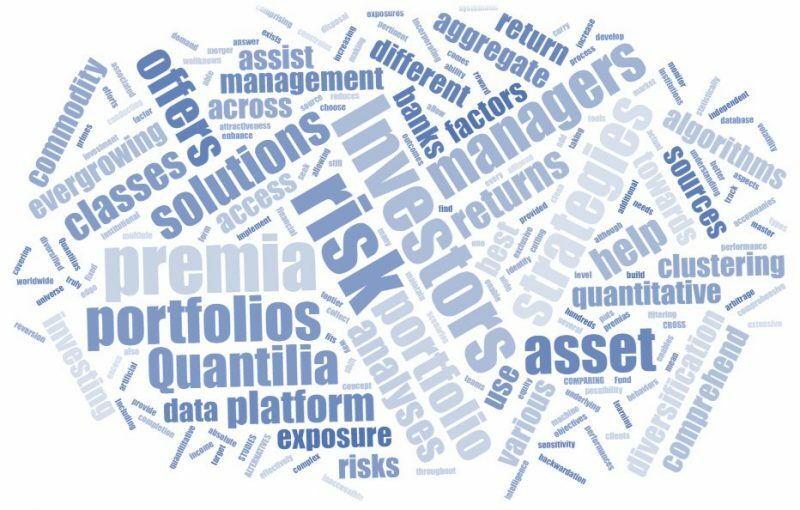 Quantilia’s platform for quantitative investment solutions offers portfolio managers worldwide an exclusive access to hundreds of risk premia strategies provided by top-tier financial institutions. Fund managers incorporating risk premia into their portfolios to add additional returns and diversification will access an all-in-one platform allowing them to collect, maintain and clean data from various banks and asset managers. To help implement risk premia’s underlying concept of increasing reward when taking some form of risk, Quantilia offers investors the possibility of filtering solutions to find the one that best fits their needs and objectives, enables them to choose only what is pertinent for their portfolios and reduces their constraints. Risk Premia strategies seek to provide investors with systematic exposure to well-known sources of excess return. As every source of return comes with associated risks, Quantilia offers comprehensive tools to monitor, aggregate and track risks and performances. Investors will be able to master the different aspects of risk premia portfolio management. A wide universe of risk premia exists across asset classes such as equity, commodity, FX and fixed income. Quantilia puts at disposal an extensive database comprising several types of primes (Including volatility, carry, commodity backwardation, mean reversion, merger arbitrage, etc.) covering all asset classes. We assist banks in the completion of their offers to answer the ever-growing demand of their clients.